Am I Really a Calculus Teacher? I was looking in the mirror the other day during one of my twice daily 90 minute sessions, and I was trying my hardest to picture the person I saw staring back as a Calculus teacher. 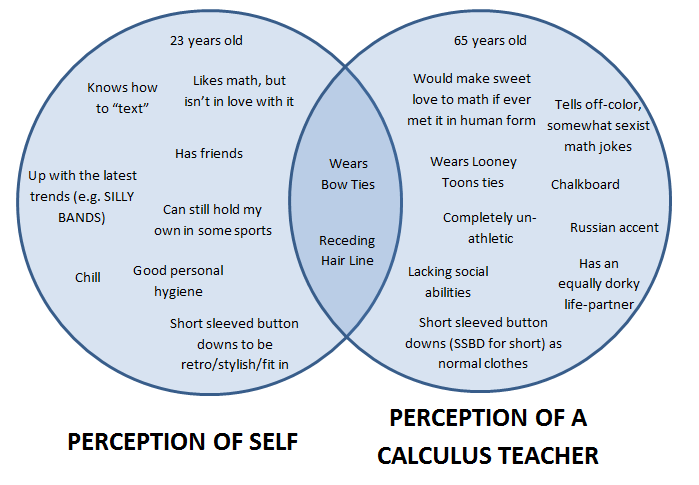 Though I am pretty sure I undoubtedly am one, or at least do a good job pretending to be one for hours and hours a week, I still can’t make it fit with my perception of who I am, especially because my perception of a Calculus teacher is completely overshadowed by my insane Calculus teacher from my high school days. I think my students agree too – I had two separate students today tell me about all the siblings they had that are older than me and somehow connect that to how weird they thought it was that their siblings could be their Calculus teacher. I made this Venn diagram to help express my thoughts about this issue. Read, think, discuss. Posted on October 18, 2010, in Calculus, Teaching. Bookmark the permalink. 1 Comment. so does this mean I should return the daffy duck tie and book of math jokes that I bought you for Christmas? ?